Ready for another adventure? 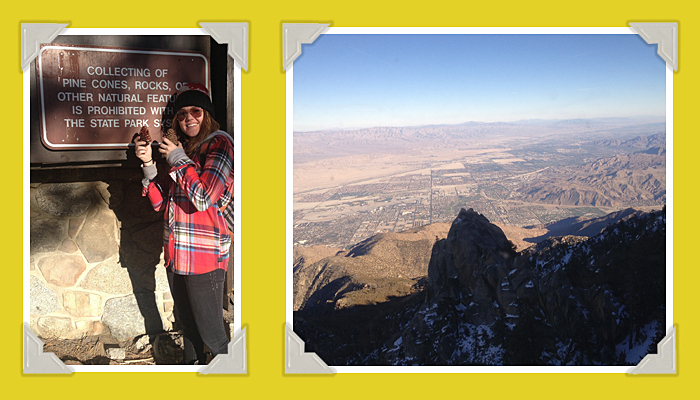 Let’s follow stylist Shannon as she travels to Palm Springs on our summer photo shoot. Planning a trip? Look below to see what Shannon had packed in her bag. Must See: Downtown Palm Springs along Palm Canyon Drive should definitely be a stop (or several) on your tour through town. This downtown area is packed with tons of specialty & vintage boutiques as well as restaurants, bars, & other entertainment venues. There is definitely something for everyone! Must Do: Ride the Palm Springs Aerial Tramway up the Chino Canyon to an elevation of 8,000+ ft in the San Jacinto Mountains. The ride is incredible and the tram car has a huge rotating floor so you can get the full effect, but what awaits you at the top is beyond words. The view is amazing and there are tons of trails that run through the San Jacinto State Park so you can explore the same terrain you got a glimpse of on your ascent. Must Eat: Tinto located in The Saguaro hotel is an Iron Chef restaurant with the best tapas around so do not miss out or if you prefer some amazing Italian, check out ‘Al Dente’ downtown. Must Pack: The mornings and evenings can be a little cool so be sure to pack a lightweight jacket, but afternoons out in the sun can get warm in a hurry so my best advice would be to include a variety of lightweight layers as you’re packing. Some of my favorites were tanks & chiffon tops that I could wear under wovens and cardigans for cooler temps, and skinny jeans that could be worn tucked into a pair of boots or cuffed over a cute pair of wedges.